I take all of those old preconceived notions of salads being nothing more than leaves and rabbit food and I throw them out the window! I am always suffering from a constant fear of getting Hangry (really, you don’t want to cross my path if and when it strikes! ), so I need to make sure that my lunch that is going to power me through the afternoon chaos of school runs, gymnastics, violin practice (god help my poor ears! ), epic Lego castles, bath and bedtime. I cannot survive on lettuce alone, nor should anyone! 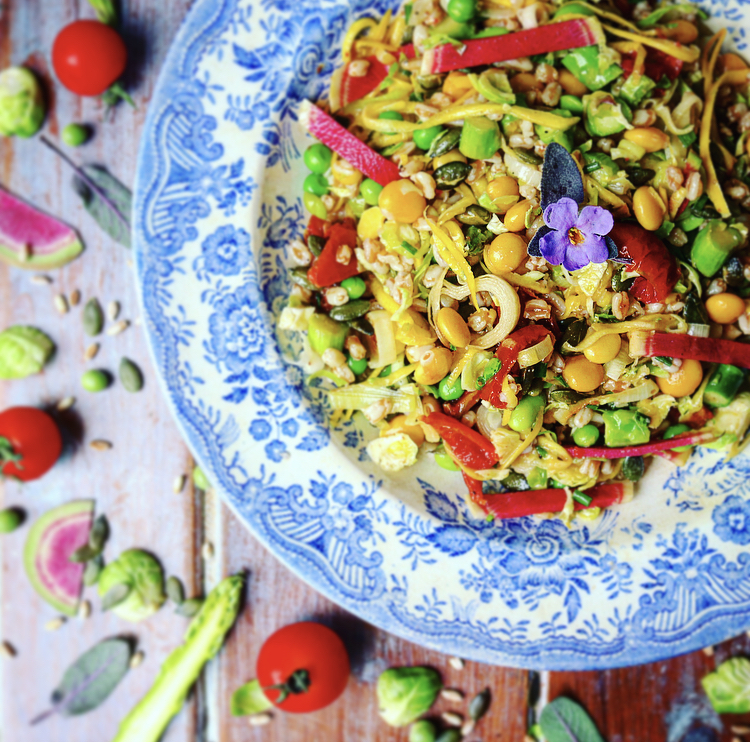 As I mentioned in a previous post on ‘How to make the perfect salad’, a great salad needs to have some complex carbohydrates (from the whole grains), some protein (in this case from the beans, edamame and peas), a good dose of brightly coloured veggies and some healthy fats. Another great reason to have a more substantial salad is that if it doesn’t contain any leaves, then it is perfect for meal prepping, as it doesn’t go soggy. Not only does it last very well in the fridge for several days, but it also heats up nicely for a great vegan main or as a side to a piece of grilled fish or chicken at dinner time. I have taken this salad on camping trips and long haul flights and always get admiring looks from fellow passengers! But it is quick and easy to make and has the perfect balance of nutrients so really does make ideal travelling food – beats a soggy sandwich any day! I tend to cook a big batch of grains each week (I normally rotate between freekah, spelt and quinoa) either in vegetable stock or bone broth. They last for several days in the fridge and are perfect to throw into a soup or stew, as well as a salad. My kids just think all the grains are called ‘rice’ so happily eat them as their carb with their dinner. Much like rice, you either boil it for 20 minutes or so; or else Merchant Gourmet do handy pre-cooked pouches that are an absolute lifesaver! This hearty salad provides 305 calories, 17g of plant-based protein and almost a half of my daily fibre requirements. Not to mention a huge amount of micronutrients – 79% and 40% of my daily Vitamin C and Vitamin A respectively, as well as almost a quarter of my Iron, which is great news for all of those vegans out there. NOTE: If you are short on time, and just want to add all of the raw ingredients, then just leave out the leeks and add the asparagus raw instead. · Halve the tomatoes, thinly slice the radishes and chop the asparagus. · Heat up the oil in a frying pan, and sauté the leeks and asparagus until browning slightly. Set aside. · Drain the peas and edamame and start to assemble the salad. · Drizzle the salad with a squeeze of lemon, some basil olive oil and good quality balsamic vinegar.